I made this for dinner tonight with Tofu and I really liked it, Beau not so much. I'm sure it would be great/better with chicken and has lots of great flavors. I've never cooked with mint but I loved it on the salad. I also added a little siracha sauce to make it more spicy. Panko can be found at the local grocery store in the asian isle. So when you're feeling adventurous I would try this salad out. Also I would add the dressing on individually rather then coat the entire salad in it before hand. Cut the tofu in half horizontally (slicing parallel to work surface). Keep the tofu stacked; cut crosswise in half to make 4 rectangles. Cut each rectangle into 2 triangles. In a large bowl whisk together 1/2 teaspoon chili sauce, orange zest, orange juice, and olive oil. Season the mixture with salt to taste. Set aside. Pour the remaining 1/3 cup chile sauce into a shallow bowl. Place the panko in a separate shallow bowl. Piece by piece, gently coat the tofu in the chile sauce and then the panko, patting it on each piece to coat. In a large, nonstick skillet, heat half the canola oil over medium heat. Gently place half the tofu in skillet. Pan-fry the tofu, turning once, until outsides are crisp and brown, about 3 minutes per side. Remove from heat. Repeat the process with remaining oil and tofu. Add lettuce and mint to bowl with dressing; toss to coat. Place equal mounds of salad in center of four plates; fan avocado slices on top. 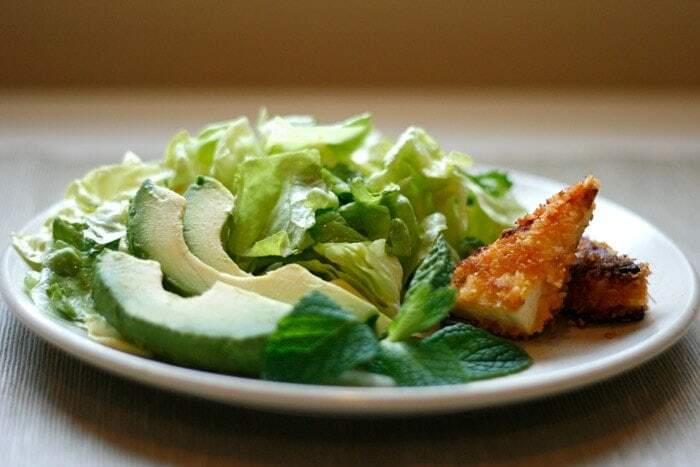 Arrange 2 tofu triangles next to the avocado and serve immediately.